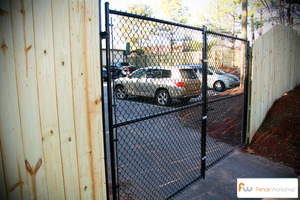 Fence Workshop™ of Raleigh, NC supplies quality driveway gates throughout the entire city. Both commercial and residential customers can benefit from the security, privacy and architecture provided by a new driveway gate. At Fence Workshop™, we not only supply beautiful fences, but we also supply estate gates, gate motors and accessories as well as decorative extras to make your fence or gate stand out. 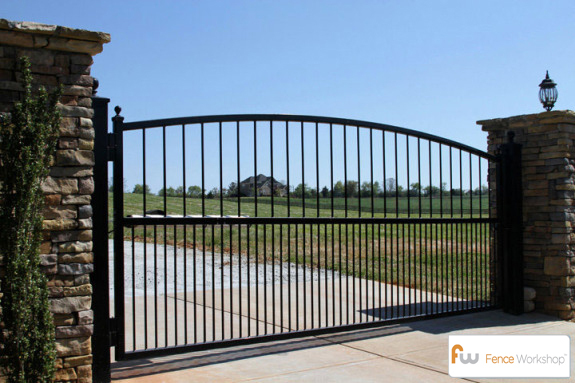 We specialize in bundling our gates and fence options to make the purchase process easy and guess-free. Fence Workshop™ has extensive experience selling top quality gate openers from the best brands in the business including LiftMaster. This automation feature is a great way to make your gate full of convenience and security, and our experienced staff can help with any questions you have along the installation process. 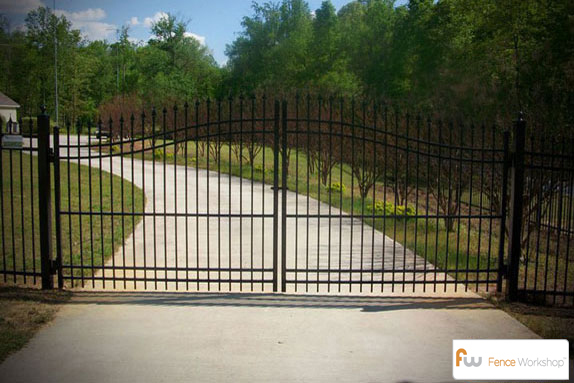 A new automatic driveway gate will give peace of mind to your family or employees, knowing they have a high level of security around the home or office Raleigh, NC. We can set up a wide variety of automation features that are tailored to how you want to control your gate. 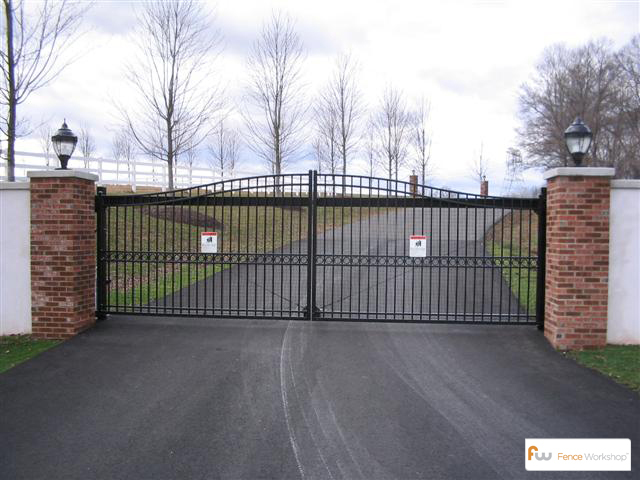 Our staff and driveway gates are ranked among the best in Raleigh. Below are examples of the different types of driveway gates we can supply for you. Our residential aluminum driveway gates offer the look and security of traditional wrought iron gates without the high cost and maintenance. Not all aluminum gates are made alike. With thicker walls, stronger aluminum, and a more durable powder coat finish, our aluminum driveway gates are far superior to other aluminum gate contractors. At Fence Workshop™ we sell a multitude of gate styles and we also ship them nationwide! Our Residential Aluminum Guardian grade gates are designed for use in residential settings and have rectangular pickets, providing a bolder appearance than the basic aluminum residential grade, adding more character and presence to your driveway gate. As is with all of our aluminum gates, the Aluminum Guardian grade driveway gates come with a limited lifetime warranty. Our commercial aluminum driveway gates offer the look and security of traditional wrought iron gates without the high cost and maintenance. 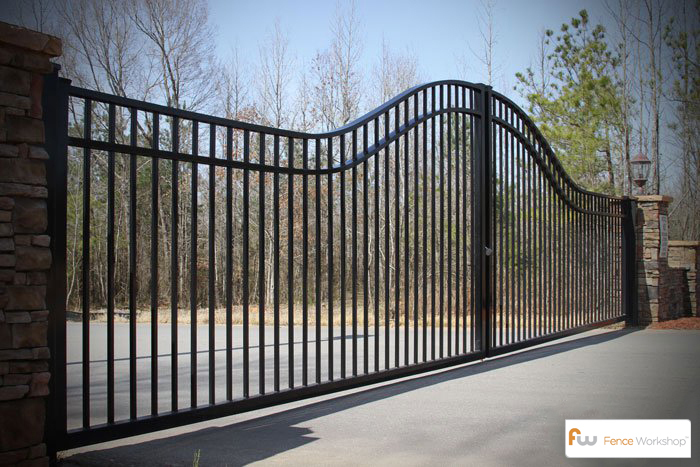 These gates are manufactured here in the United States and are made to weather the harshest environments while adding prestige and value to your property. With thicker walls, stronger aluminum, and a more durable powder coat finish, our aluminum driveway gates are far superior to other aluminum gate providers. Our industrial aluminum driveway gates offer the look and security of traditional wrought iron gates without the high cost and maintenance. Not all aluminum gates are made alike. With thicker walls, stronger aluminum, and a more durable powder coat finish. Fence Workshop supplies and ships nationwide! Our Industrial Aluminum Cantilever Gates are some of the best in the industry. From the expertly crafted trolley assemblies, to the chain link options and additions, aluminum cantilever gates are a great choice for your commercial or industrial property. Our industrial aluminum cantilever gates come in so many styles, it can be overwhelming, we specialize in helping you choose the best option for your business. 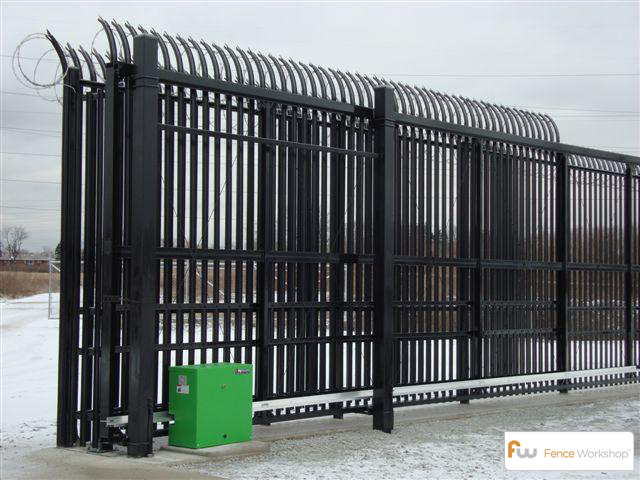 Cantilever Gate systems are available for ornamental, chain link, and security applications. TransPort™ Cantilever Gates offer superior strength as the track is 60% heavier (by weight) than companies extrusions. TransPort™ uses a double track frame with full tracks on both the top and bottom. Ameristar double-track cantilever gates can open up to 30 feet. 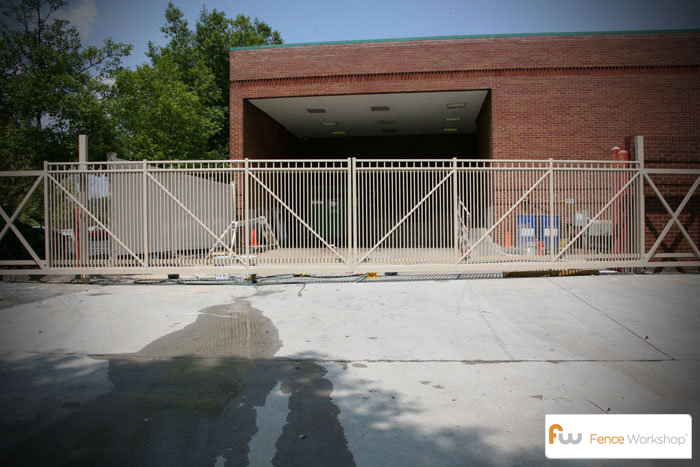 When using two bi-parting cantilevers, TransPort™ gates can span openings up to 72 feet. The Estate™ design is a statement in itself. It adds value and aesthetics to complete the look of elegance. Private businesses, large estates and condominium complexes are ideal properties for the prestigious appeal of the Estate™ entry gate. All framework is 1/4″ thick and all intersections are welded. Standard Entry Gates are available with single leaves for openings up to 14 feet or with double leaves for openings up to 28 feet. Ameristar Grand Estate Gates This latest offering from Ameristar, unveiled at the FenceTech trade show, is sure to please customers upon its release this summer of 2011. These Grand Estate™ driveway gates from Ameristar are both decorative and secure. This line of gates comes in many different styles. The Tuscan Villa model is pictured here here. If you’re looking for a steel roll gate option, Ameristar offers their PassPort Roll Gate. For a more ornamental look, add rings to a 3-rail option. Ameristar’s PassPort Roll gates come in both a commercial (3/4″ pickets) and industrial (1″ pickets) grades. For a higher level security gate, our PassPort IS (Impasse Security) Roll Gate is available with a proprietary corrugated Impasse® Shape, 2 3/4″ wide and 1/8″ thick, in Trident, Stronghold and Gauntlet styles. Installing a chain link gates on your commercial or industrial property is one of the most cost effective ways to secure the entrance or exit. 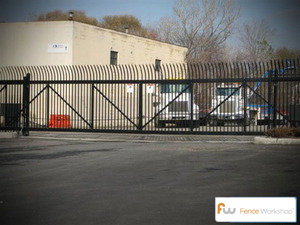 The most important difference of chain link security gates over a steel, aluminum, or wood is the cost. Chain link gates can be upgraded to create the privacy of these other types of gates as well as being very easy to automate and nowhere near as heavy. Because of this, commercial chain link fence doesn’t require the same upgraded openers to handle its weight. Get Started – Shop Our Gates Now!